Clerics aid fellow adventurers with the holy power of light and deal damage with commands channeling holy wrath. The cleric can also bless their allies with magical shields and even increase their damage, making clerics an essential part of any raiding group. When a cleric speaks a word of power, you live or die. Clerics can equip a hammer or mace and a shield. They can only wear armor specific to their class and level. Main attributes for Clerics to focus on healing are Endurance (more hit points and defense) and Spirit (more spirit points). If you want to be a combat cleric try putting stat points into Strength (to increase damage output), Endurance, and Spirit. For your skill empowers (under skills button "K" key), focus on increasing damage output at first. This will help you in combat should you wish to solo. NOTE: Do not put any empowerment points into the duration or spirit point cost of buffs. For a boost in damage output, increase damage of Bash. For healer-type builds, reduce the cool down of your healing spells for faster healing. Don't worry about using up all your skill empower points and not being able to change them later; you can buy a skill empower reset scroll in the Fiesta store and try a different combination. 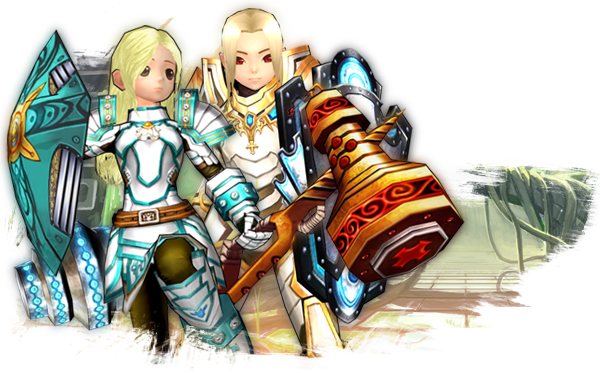 At level 20 you can become a "High Cleric" through your class trainer quest and grow in your skills and power and at level 60 you can become a powerful "Paladin".